Recently made a weekend trip to Alaska, a great and beautiful state. Among other highlights of the trip was a visit to Fairbanks, where I managed to spend a little time at the Fairbanks Community Museum. The museum has many artifacts from the Klondike Gold Rush, an event featured in the pulps from time to time. James B. Hendryx wrote the popular Halfaday series which was set during the gold rush, featuring Black John and Trooper Downey of the Royal Canadian Mounted Police. The Fairbanks museum is small, but whoever is managing the museum has done an excellent job. The collection is small but focused and manages to convey very well the times of the gold rush, and the life of the people there. A steamer departing San Francisco in 1897 taking miners to the Klondike. Ten thousand people are estimated to have come there to see them off. Estimates are that sixty to eighty percent of stampeders were Americans, the rest mostly from Canada and many other countries. An interesting snippet from Wikipedia on the frenzy: "Mass resignations of staff to join the gold rush became notorious. In Seattle, this included the mayor, twelve policemen, and a significant percentage of the city's streetcar drivers." 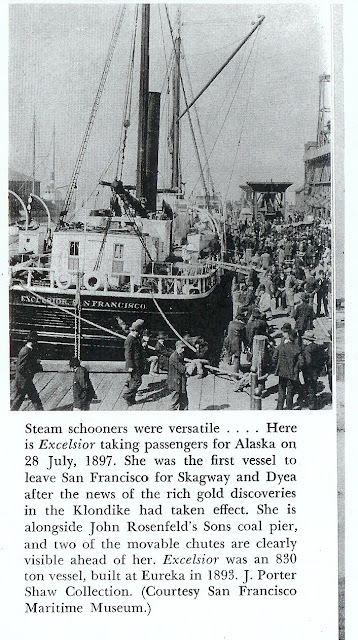 The steamer would later dock in Seattle. These are two of the dog sleds in use at the time of the Gold Rush. The one on top is an Eskimo sled, the one at bottom is called a Yukon style tobbogan. Miners may not have made money, those transporting and supplying them certainly did. Look at these ads in Toronto and as far away as St. Louis, Missouri. Even the current U.S. president's grandfather got in on the bonanza, opening a hotel in Bennett, BC (now a ghost town). The hotel building was later moved to Whitehorse to be nearer Dawson City. To be admitted to Canada, miners had to have supplies for a year, and pay customs duty of 25%. The supplies weighed about 2300 pounds, and had to be carried into the Yukon on the miner's back. Chilkoot pass was so steep that dog sleds couldn't be taken up. If you wanted dog sleds, you had to carry the dogs up there. At the top of Chilkoot pass was a customs house at a place called The Scales, because that was where the supplies were weighed before admitting the miner. That's the place you see in the opening scenes of Charlie Chaplin's classic movie, The Gold Rush. Chaplin, always the perfectionist, didn't use special effects for this scene. Instead, he had 600 extras climb up 2300 feet up Mount Lincoln in Colorado. Chaplin and every other available member of the crew not actively engaged in shooting climbed with them. And of course, stock in the gold mines sold well. Often, it wasn't even worth the paper it was printed on. Anything would sell if it had the word Yukon in its name: boots, soup, stoves, medicine chests and many more. Sometimes the products had no obvious connection with the Klondike, like the head rub. And sometimes they did, like the medicine chest which seems to be aimed at stampeders. Gold dust was the currency of the miners, as these letters about buying supplies show. The object of the game is for the player to start from Fort St Michael, by the Yukon River, reach Klondike, secure his gold, and return in safety by way of Dyea and Juneau. To succeed, however, he has to overcome all the perils, obstacles and privations on the way which beset the miner in his quest for Klondike treasures. This is a re-creation of a miner's cabin (or was it a trapper's cabin)? Remnants of the gold rush are still there in the Klondike, fewer every year as age, weather and souvenir seekers take their toll. In popular culture, there isn't much mention of the Klondike nowadays. Klondike solitaire is probably most people's closest contact with this exciting time. The famous author Jack London was a miner till injury forced him out of mining; his stories are still read and enjoyed. So are James B. Hendryx's entertaining stories of Halfaday Creek. Soon only the stories and pictures will remain. I'm glad I was able to see a little of this history.